Woven Swiss Tulle bodice with straps. 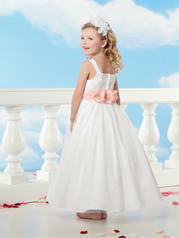 Shirred Crystal Satin waistband with flowers at center back and full floor length Swiss Tulle skirt. Available in ankle & floor length. Available in any Swiss Tulle color in combination with any Crystal Satin color. Solid Light Ivory is not available.